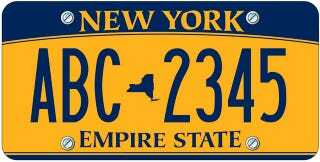 Albany's pitching replacing all license plates with these new "Empire Gold" plates — similar to ones used between 1973 and 1986 — as a safety enhancement, citing increased visibility. Taxpayers, however, are up in arms over the mandatory $25 fee. "These new plates, in the official colors of the State of New York, will help maintain highway safety, reduce the number of unregistered and uninsured vehicles on our roads, and generate $129 million in General Fund revenue over two years, which will help address the State's financial crisis," said State Commissioner of Motor Vehicles David J. Swarts yesterday. It's that $129 million that people are taking issue with. Where most private owners will only be responsible for one or two cars' worth of $25 fees, small business owners fear the "plate tax" unfairly targets them. It's hard to understand the kerfuffle over a $25 fee, but multiply that by a fleet of, say, 300 vehicles and you begin to understand the objection. An anti-new NY plate site has already sprung up, NoNewPlates.com, where over 57,000 people have already signed a petition opposing the plate's implementation. Rather than simply representing a permanent increase to registration fees, the new plates are controversial because they're being added as an additional one-off cost for all motorists. Albany is perceived to have manufactured the need for them, suddenly citing visibility concerns with the old plates seemingly out of the blue (and white). The plates will begin rolling out in March next year, and will be mandatory with all new vehicle registrations and renewals. The state already raised general license and registration fees 25% in September.